Now of course I am not in favor of vandalism. Surely no one reading this blog, you classy and tasteful readers, you, would vandalize anything, leaving little bits of glass all over the bus stop. Certainly not. That said, it looks pretty cool, doesn’t it? 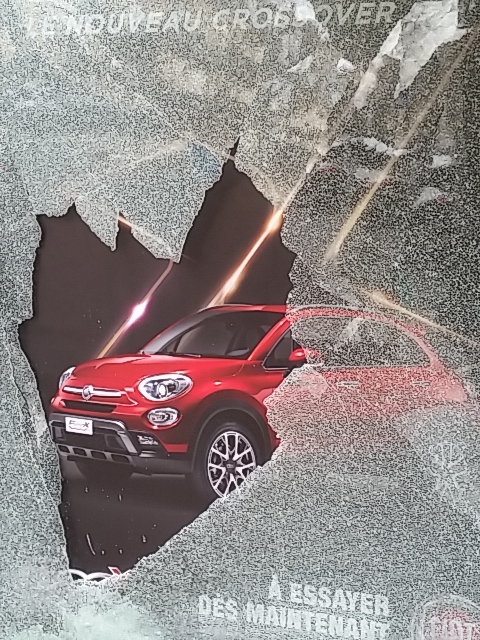 Like that Fiat is just so peppy that it burst right through its little glazed cage? So what’s the story? Artistic statement — in which case Fiat owes somebody a lunch — or smartass thug who got lucky? I think, best case, it’s a smartass art fart, not yet mature enough to realize that all the world is not his studio. I’m showing my age, aren’t I? Seeing this poster got me thinking about something I like so much about living in France. People here value the life of the mind, to an extent and depth that we just don’t, in the States. David Lebovitz wrote once about having trouble with some bureaucratic nonsense at his bank, the usual “we’re not sure you’re legitimate” thing. The trouble vanished when, one day, he happened to walk in with a couple of his books in his bag. Almost in frustration he showed them to the banker saying, in essence, look, this is what I do. As it turned out, that melted the final resistance to whatever it was. There were no problems after that. You see, the banker realized that David was an artist. Well, okay, and a wildly successful published author, but he had had the numbers all along. This was something else. I regularly have similar experiences, though to be sure with much less justification. A while ago I had cards printed with a few of my photos. I hand them out in preference to constantly repeating and spelling every last detail of my contact information. The cards started as a whim, a project for late one night when I couldn’t sleep. They have turned out to have a significant effect on my dealings with people here. It doesn’t matter, who, really, my vet, salespeople, could be anyone, they stop and really study the photo. Then they often say oh, you’re an artist. It goes from there. They could say most anything after that. What those cards stop cold is any question of why I am in France or why in the world would I be fixing up that house. Suddenly it all makes sense to them. Of course an artist would come to France. Of course she would put massive time and energy into creating a personalized environment, away from the distractions of the city. An artist needs a suitable atelier. So just like that, they start to see things my way. After nearly a decade of coming here for much of the year and another year of living here — I am just about to renew my residence permit — I still feel like I just arrived. Thus I have no explanation or theory for this. I just know that I have this experience pretty regularly. I like it. I want to find out more about it. I went up a couple of notches when a neighbour found out that I am also an (commercially unsuccessful) artist. Image is everything. And your blog is far from shambolic. To be fair, it gives folks a hook, a way to identify us and to explain what, exactly, we are doing there. I like that writers don’t really have to be published; writing, even just a blog, is enough. I don’t have to have a gallery; it looks like my business cards give me plenty of credibility. Previous Post Drywall.And about time, too.